Business, education and government entities use wide area networks to relay data among staff, students, clients, buyers, and suppliers from various geographical locations. In essence, this mode of telecommunication allows a business to effectively carry out its daily function regardless of location. The Internet may be considered a WAN. Related terms for other types of networks are personal area networks (PANs), local area networks (LANs), campus area networks (CANs), or metropolitan area networks (MANs) which are usually limited to a room, building, campus or specific metropolitan area respectively. 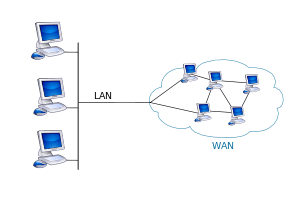 The textbook definition of a WAN is a computer network spanning regions, countries, or even the world. However, in terms of the application of computer networking protocols and concepts, it may be best to view WANs as computer networking technologies used to transmit data over long distances, and between different LANs, MANs and other localised computer networking architectures. This distinction stems from the fact that common LAN technologies operating at Layer 1/2 (such as the forms of Ethernet or Wifi) are often designed for physically proximal networks, and thus cannot transmit data over tens, hundreds or even thousands of miles or kilometres. WANs do not just necessarily connect physically disparate LANs. A CAN, for example, may have a localised backbone of a WAN technology, which connects different LANs within a campus. This could be to facilitate higher bandwidth applications, or provide better functionality for users in the CAN. WANs are used to connect LANs and other types of networks together, so that users and computers in one location can communicate with users and computers in other locations. Many WANs are built for one particular organization and are private. Others, built by Internet service providers, provide connections from an organization's LAN to the Internet. WANs are often built using leased lines. At each end of the leased line, a router connects the LAN on one side with a second router within the LAN on the other. Leased lines can be very expensive. Instead of using leased lines, WANs can also be built using less costly circuit switching or packet switching methods. Network protocols including TCP/IP deliver transport and addressing functions. Protocols including Packet over SONET/SDH, MPLS, ATM and Frame Relay are often used by service providers to deliver the links that are used in WANs. X.25 was an important early WAN protocol, and is often considered to be the "grandfather" of Frame Relay as many of the underlying protocols and functions of X.25 are still in use today (with upgrades) by Frame Relay. Academic research into wide area networks can be broken down into three areas: mathematical models, network emulation and network simulation. Performance improvements are sometimes delivered via wide area file services or WAN optimization. Many technologies are available for wide area network links. Examples include circuit switched telephone lines, radio wave transmission, and optic fiber. New developments in technologies have successively increased transmission rates. In ca. 1960, a 110 bit/s (bits per second) line was normal on the edge of the WAN, while core links of 56 kbit/s to 64 kbit/s were considered fast. As of 2014, households are connected to the Internet with ADSL, Cable, Wimax, 4G or fiber at speeds ranging from 1 Mbit/s to 1 Gbit/s and the connections in the core of a WAN can range from 1 Gbit/s to 100 Gbit/s.